Next week will be one year since Kevin’s motorcycle accident. That was a nightmarish trip I wouldn’t wish on ANYONE. I got a call last April 16th that no wife, no mother, no PERSON ever wants to get. It was from a man I did not know. He was an eye witness to Kevin’s accident and was calling me to let me know what was going on and that Kevin was being taken to a nearby hospital. It was hard to hear him over the sirens in the background. It was a horrific experience. I thought he had died when I got a call from the hospital chaplain asking me how soon I would get there. I was in the hospital parking lot when he called. I have quite honestly never had a more terrifying moment than when I got that call. Long story short – Kevin had shattered his pelvis (one doctor compared it to a bag of broken glass) and had to be moved to Columbia Missouri because no one in Springfield could operate on him – that’s how badly he was injured. My mother-in-law and I lived at the Columbia hospital for two weeks before they finally moved him back to Springfield where he stayed in a rehabilitation facility for another 2 1/2 weeks before being deemed fit enough to go home. In that interim, I had to learn how to take care of him, how to transfer him from the bed to his wheelchair, how to help him use the bathroom, etc. Since he had three surgeries to implant three metal plates and several rods to reconstruct his pelvis, he wasn’t allowed to put any weight on his legs for six weeks. We had a hospital bed in our living room and my father-in-law and brother-in-law came over and built a ramp so we could get Kevin in and out of the house in his wheelchair. Once he was given the green light to begin rehabilitation exercises, it didn’t take Kevin long to re-learn to walk again. He soon graduated from a wheelchair to a walker. He was so determined not to allow this accident to take anything away from his life, he INSISTED that we continue with our vacation plans and go to New York and sail to Canada. Which we did – and it was NOT easy on Kevin (or any of us, quite frankly). However, because of his determination and courage, he began to heal by leaps and bounds after our New York trip. He soon graduated from a walker to a cane and only needed the cane a few weeks before tossing it aside. He’s now walking normally again, though has a slight limp and still has trouble with his right foot. But he has refused to allow the accident to slow him down and he went back to work (in fact, he opened his own business) and has been busy crawling under the house and digging up our backyard for a patio. He’s truly an inspiration to me. 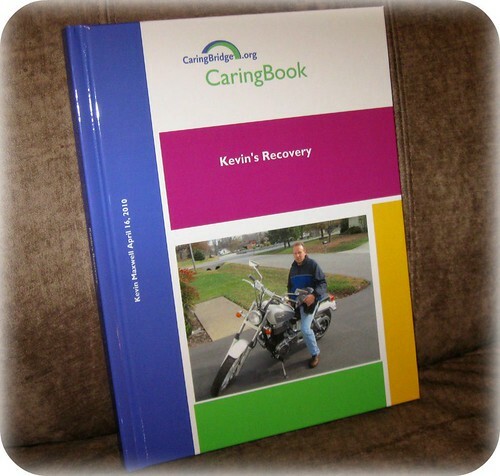 I recorded his journey on the CaringBridge website – partially to let friends and family know how he was doing and partially because it helped ME to process everything I was going through by being his helpmate and rock. The CaringBridge website gives people an option to turn their journal into a book and that’s what I did. I received the book yesterday. We couldn’t be more pleased with it. The CaringBridge people also included the guestbook, which a lot of people left comments in, and it’s really nice to have a record of all the nice things people wrote us during those trying times. It was expensive, but well worth it. We now have a physical reminder of that horrific few months in 2010 when our world shattered around our ears. With God’s grace, Kevin not only survived the accident (and many people in this type of accident do NOT survive), but he’s back to normal and getting stronger every day.